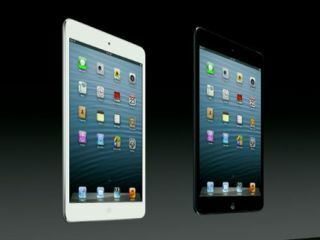 Live blog from Apple's iPad Mini event | What Hi-Fi? 7.13 And that's the end of the show. So... what do you think? Let us know in the comments. A new iPad, new iPad Mini and new MacBook Pro and a new iMac. 7.12 So the iPad Mini is real. Starts at $329, UK price expected to be £269, Google Nexus starts at $199 (16GB vs 8GB, however). 7.08 iPad Mini 32GB is $429, 64GB $519. Add $130 to each price if you want 4G LTE. 7.00 iPad Mini: A5 dual core chip, FaceTime HD camera on front, 5MP camera on the back, LTE and faster WiFi. 6.58 The iPad Mini has same screen resolution as iPad 2 = 1024 x 768. 6.56 So we have two new iPads. The 4th gen iPad and iPad Mini. All apps and games work on the new iPad Mini. 6.54 iPad Mini: 7.9in, 1024 x 768 resolution. 7.2mm thin. 6.53 Can be held in one hand, thin, machined design, light. Apple's Phil Schiller keeps saying 'thin'. 6.49 Updated the Lighthing connection, support for 4G LTE and Lightning to USB connector, HDMI out. Same price. 16GB for $499. 6.48 The 4th generation iPad is confirmed. Faster A6X chip, doubles CPU performance (says Apple), with 2x graphics power, new image processing and same 10-hour battery life. 6.47 "We've got some really cool stuff to show you"
6.45 Apple claims 90% of all tablet web traffic. Wow. 6.40 iPad time! Apple has sold 100 million iPads. More in the last quarter than any PC seller sold of entire line-up. Yep, fairly impressive. 6.38 There's much talk of the new Fusion Drive. Essentially a flash drive and a hard disk drive working together, with your OS on the flash drive while everything else is saved to the HDD. Got it? 6.32 There's a new iMac, too, which looks rather nice. Very thin (no surprise). Just 5mm at the thinnest point. But again, no optical drive! Won't somebody think of all our discs?! Does nobody put discs in their computers anymore? 6.28 The new Mac Mini has 2.5GHz processor, 4GB RAM and 500GB HDD for $600. Or 16GB RAM, 1TB HDD for $999. Yep, we're waiting for iPad news, too. 6.26 First mention of the word 'Mini'... for the Mac Mini. D'oh. 6.22 Like optical drives? You're out of luck, the new MacBook Pro doesn't have one. It does have an HDMI connection however! 2560 x 1600 Retina display, too. 6.19 13in MacBook Pro has "way more pixels than an HD TV". Looking forward to finding out how many pixels a 7.85in iPad Mini might have. Any guesses? 6.16 Brand new 13in MacBook Pro, it's just 0.75in thin, lightest MacBook Pro ever... Waits patiently for iPad news. 6.12 App Store: 35 billion apps downloaded from the App Store. 400 million books downloaded from the iBookstore. 6.10 Apple has sold 3 million new iPods to date. Impressive. 6.07 200 million iOS devices now running iOS 6. 'Fastest upgrade in history'. 6.05 Cook talking iPhone 5 sales. Five million sold in opening weekend. 6pm And we're off! Tim Cook, Apple CEO, on stage. 5.50pm Ten minutes to go... The new iPads are all expected to have the new Lightning connector, so you'll need the £25 adapter in order to use it with your existing docks. We'll be covering the Apple launch live and gathering up all the crucial information right here. We're expecting a new, smaller iPad - iPad Mini - and anything up to 24 new iPad models if reports are to be believed. Let us know your thoughts in the comments below and we'll post them in to the live blog. The event is expected to kick-off at 6pm and we'll update this post from the top so just press refresh!